Bruce Nodwell (May 12, 1914 – January 20, 2006) was a Canadian inventor who invented the Nodwell 110, a multi-purpose two-tracked vehicle capable of traversing a wide variety of adverse terrain, including sand, mud, muskeg, swamp, and snow. In 1947, Imperial Oil made the Leduc No. 1 discovery in Alberta and the economy began to rapidly expand. As the oil exploration moved northward from the Leduc region, the oil men soon encountered muskeg, a wet, boggy, swamp-like matter through which conventional equipment could not pass. Even WWII tracked equipment could not handle the requirement or they did not have sufficient load capacities. Imperial Oil asked Bruce Nodwell to construct two vehicles they had designed to try to provide mobility over muskeg. These vehicles were unsuccessful, but Bruce had become aware of the need for large tracked vehicles. His first designs, that were to be either tracked or wheeled, were called North Kings and 16 were sold, but even they did not have enough mobility or durability. Bruce then concentrated on a vehicle design using soft tracks and single rows of wheels to support them. In 1955, Bruce’s invention of the double sprocket made it possible to drive wide tracks and also keep them in place while using a single row of wheels. The combination of the splice in the belt and the double sprocket allowed the use of any size or shape belt the vehicles needed. The “wide track” concept was born. They were now able to build a new and different type of machine. The new vehicle was first called the Tracked Truck. However, everyone in the industry knew Bruce, because of his close contact with existing and potential customers, so they called the vehicle the “Nodwell”. Later, the vehicle became known as the Nodwell 110, indicating its payload in 100 pound units. Today it is affectionately called the “Noddy”. Even though the Model 110 was proving to be a more successful operating unit, the Canadian marketplace was reluctant to purchase many Nodwell vehicles due to memories of past failures. For a while it became necessary for the company to try another market, making their first major sale to Western Geophysical in Alaska. This sale consisted of a complete geophysical crew, including five drill carriers, two recorders, a mechanics shop, kitchen unit and crew quarters, all mounted on the Model 110 vehicles. This crew operated successfully in severe muskeg conditions, spreading the reputation of the Model 110 throughout the geophysical industry both in Canada and Alaska. This model became the standard for geophysical work in the muskeg country of Northern Canada and Alaska. The Nodwell 110 was ultimately so successful that over 1,500 vehicles of this style were manufactured by the industry. 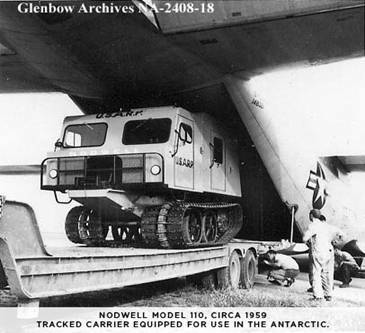 Several Nodwell vehicles were also delivered to the US Antarctic Research Organization. As Bruce expanded the applications and product line, additional financing was required and he used a number of different companies including North King Equipment Ltd., Bruce Nodwell Ltd. and in 1958, Robin-Nodwell Ltd.
Bruce left Robin-Nodwell in 1965 to join his son, Jack Nodwell, in a new company, Foremost Industries. Foremost, over the years, expanded the product lines to encompass both tracked and large-tired vehicles with load capacities from 5 to 70 tonnes. How did Foremost Get Its Name? At the time Jack Nodwell was forming the company, the question of what name to use came up. The family name “Nodwell” was not available due to two pre-existing companies. Jack’s father, Bruce, had suggested looking at maps of Alberta and Saskatchewan for ideas as he said, “Early settlers had lots of time to think about what to name their new towns.” Jack spotted Foremost and found that the name was available. Foremost is a small town in Southern Alberta located 106 km SW of Medicine Hat. Our logo used today is the original Foremost logo. 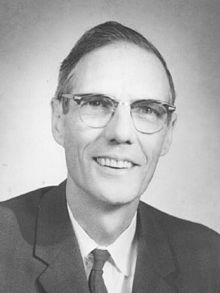 In 1970, Bruce Nodwell was made an Officer of the Order of Canada, Canada’s highest civilian honor, “for his contribution to the opening of the Canadian North through his inventions and development of various types of tracked vehicles”. A mountain in Antarctica, “Nodwell Peaks”, was named in recognition of the vehicles in use by the various Antarctica Research institutions and there is a large lake in Canada’s North West Territories called Nodwell Lake (Lat 67.4539, Long -135.3115). During the early days of geophysical exploration in the north, the Nodwell vehicles were often sent out onto lakes once the ice was believed to be strong enough. The tracks in the snow would speed further freezing for other equipment. A Nodwell 110 fell through the ice of this lake and from then on it was known as Nodwell Lake. Fortunately, the crew was able to quickly exit out of the escape hatch on the roof that was standard equipment. Foremost began its acquisitions in 1998 with Drill Systems. In January 2013, The Foremost Group of Companies came together under a single name. Universal Industries, Corlac Industries, Maloney Industries, Peaceland Fabrication, Stettler Oil & Gas, Brahma Compression, Steelhead Welding, and Foremost Industries launched the beginning of a new era as “FOREMOST”. Today, Foremost has two distinct divisions, Foremost Energy Equipment and Foremost Mobile Equipment, and operates out of 9 locations with over 640,000 sq. ft. of manufacturing space and 600+ employees. In 1964, the Mountain “Nodwell Peaks” in Antarctica was named in honour of Foremost’s founders, the Nodwells, due to the enormous support and innovation equipment (Nodwell 10) used in Antarctica.The first Husky 8 was manufactured and sold in 1967; Jack Nodwell closed two contracts in 1970 in Moscow for 67 Husky 8 units. In 1970, Bruce Nodwell was made “Officer of the Order of Canada”, Canada’s highest civilian honour for his contribution to the opening of the Canadian North through his inventions and development of tracked vehicles. In the 1970’s Foremost created a tracked bus for Brewster. In 1981, Foremost sold the first wheeled “Terra Bus” to Brewster for their Glacier Tours for tourists on the Columbia Ice Fields in Jasper, Alberta. A further 23 buses have been purchased for their fleet. In 1984, Foremost won a contract for $36,000,000 for 50 Husky 8G with fire fighting packages, plus spare parts, delivered to the Soviet Union. A series of commemorative postage stamps, called Historic Land Vehicles, was issued by Canada Post Corporation between 1993 and 1996. The Robin-Nodwell RN 110 is illustrated on an 88 cent stamp. In 2002, Foremost Mobile Equipment partnered with NASA to launch scientific balloons using our Commander vehicle in the Antarctic, and then worked with them again to develop the NASA Mars Lander Balloon Launch Vehicle used successfully in two launches to date in Hawaii on June 28th, 2013 and on June 8, 2015. In July 2013, the CNRL Lamella tanks were the largest pieces of equipment to date to traverse Alberta roads.